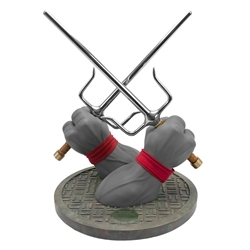 Our Monochrome Raphael Sai Prop Replica Convention Exclusive pays homage to the original black and white Teenage Mutant Ninja Turtles comics that started it all. Raphael is a hothead, the most opinionated, impulsive and restless Ninja Turtle. Raph’s weapon of choice is a pair of sai, short swords which are traditional martial arts weapons. Growing up as fans of the ‘80s TMNT show, the artisans at Factory Entertainment wanted to create a museum quality realization of Raphael's signature weapons suitable for "mature" collectors who still want to celebrate their Turtle Power! Working closely with the team at Nickelodeon and with extensive study of the classic animated series, we were able to create an accurate real world replica of the sai wielded so expertly by Raphael. Each sai is cast from solid metal that has been chrome-plated and features a leather wrapped handle and brass-alloy pommel. To display the Sai we could think of no more fitting ‘stand’ than facsimiles of Raphael’s hands, cast in polyresin with integral magnetic latches which safely secure them to the metalized resin sewer lid base, that includes a cast metal plaque bearing the edition number. The exclusive is limited to 100 pieces, each of which has been hand-signed by TMNT co-creator Kevin Eastman. Single Payment & Payment Plan Details If you selected the "Single Payment" option when adding an in stock item to your cart, your account will be authorized and charged after your order is placed for that item. If you selected the "Single Payment" option when adding a pre-order item to your cart, you will not be charged until the item(s) arrive in stock; your credit card will not be charged at this time. You will be charged and will receive a separate email with tracking information for your shipment once the item(s) ships. Availability status is located on each product page beneath the price and above the Product Code. If you selected "Payment Plan" when adding an in stock or pre-order item to your cart, you will be charged the initial payment/deposit and any applicable shipping and taxes during checkout. This will serve as your first payment within the agreed upon installment. All remaining payments in the installment amount listed will be charged every 30 days until the balance is paid. In stock items on a payment plan will ship once the full balance for the item has been paid in full. Pre-order items on a payment plan will ship once the full balance for the item has been paid in full and once the product arrives in stock. If your order contains both in stock and pre-order items, we will ship the in stock items when the balance is paid in full and the pre-order items will follow in as a separate shipment when they arrive in stock and once the balance is paid in full. The status for the order in your factoryent.com account screens will show as shipped, this only refers to the in stock items.